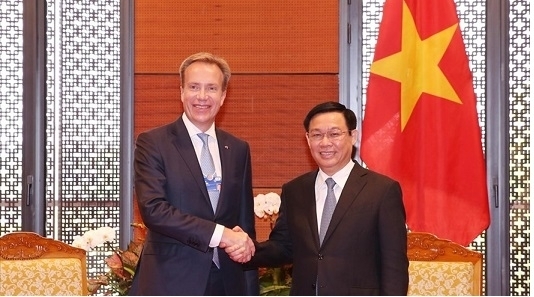 Deputy Prime Minister Vuong Dinh Hue hosted a reception for World Economic Forum (WEF) President Borge Brende, in Hanoi on September 13. At the meeting, Deputy PM Hue expressed his delight at the significant number of world leaders and businesses presented at the WEF on ASEAN (WEF ASEAN) this year, saying it reflects their interest in partnerships and investment ties with ASEAN in general and Vietnam in particular. He also spoke highly of WEF for its close consultation with Vietnam in designing the topics, content, and agenda of the event, which is in line with global trends and ASEAN’s 2018 theme of resilience and an innovative community. 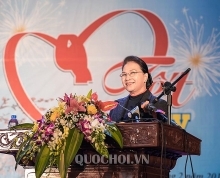 The Deputy PM also asked the WEF to help Vietnam build a national innovative centre to assist and incubate start-ups. For his part, WEF President Borge Brende said that the participating businesses have been impressed by the forum, as well as lauding the collaboration demonstrated by the host nation, noting that it has brought benefits to both ASEAN and Vietnam. Brende forecast that Vietnam’s economy will grow by approximately 7% in 2018 with the value of its stock market doubling in the past two years. 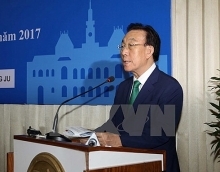 He affirmed that the WEF is willing to support Vietnam's effort in stepping up innovation amid the 4th Industrial Revolution.